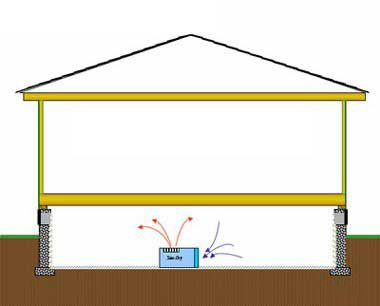 How Do You Dehumidify the Crawlspace? | The Last Step in Crawl Space Encapsulation is Dehumidification. How Do You Dehumidify the Crawlspace? Your sealed crawlspace can still draw moisture, sometimes from your living space (especially if you’re not running an AC in summer). To control moisture levels, it’s best to install a crawlspace dehumidifier. The SaniDry™ Crawl Space Dehumidifier is the best choice available for dehumidifying your basement or crawlspace. With this system, your below-grade area will be drier, cleaner, healthier and more energy efficient. By lowering the relative humidity, the air in your crawl space will be easier to heat and cool. It is Energy Star rated, being able to dehumidify 100 pints of water with the same energy as a 40-pint model. Not only will it dry the air, but as it blows the air around the crawl space, anything else that is saturated with water, including wood and insulation, will dry out as well. The SaniDry™ does more than just dehumidify. When relative humidity in your crawl space drops below 50%, the environment will be inhospitable to dust mites and most types of mold. In addition, the SaniDry™'s filter removes particles from the air as small as two microns and a special optional filter will filter out odors. Most dehumidifiers need to be emptied every day to keep the crawl space or basement dry. Otherwise, they will fill up and the unit will shut off. The SaniDry™ is different. It can drain the water it removes through a hose by either natural gravity or with the use of a small pump. The SaniDry™ never needs daily maintenance to keep your crawl space dry.